On Sunday, Mr Morrison and Mr Shorten wished the Australian Tamil Community a Happy Tamil New Year. 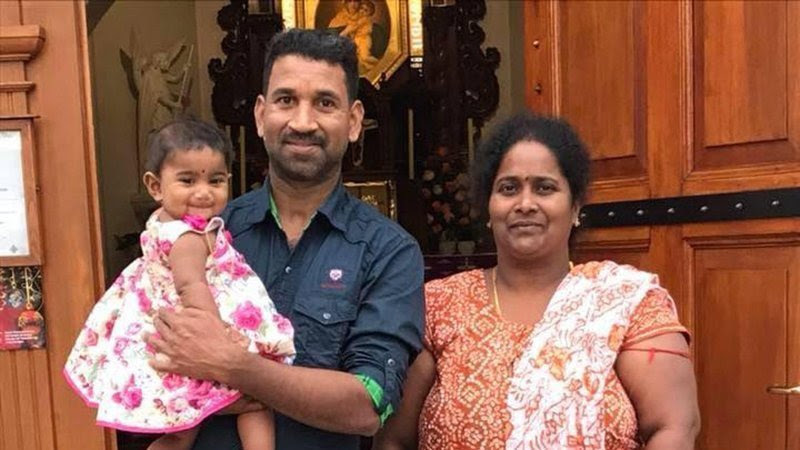 The same day, Biloela’s beautiful Tamil family spent their 406th day imprisoned in Melbourne’s detention centre. This family needs more than wishes. Please, can you click through to bit.ly/emailyourMPnow and tell our politicians to bring them home to Bilo? On February 27, 2019, the last four children imprisoned by the Australian government on Nauru left with their parents for the USA. All the imprisoned children should finally be free to live a normal, decent, peaceful life, to go to school, to grow, and learn, to laugh and play and rejoice that their unjust and cruel imprisonment is over. Ended. When Befriend a Child in Detention began in 2014, there were approximately 800 asylum seeker and refugee children held in closed mandatory detention – across Australia, on Christmas Island, and finally on Nauru. Their crime – that their families had escaped from war and tyranny to seek refuge in a prosperous and humane country, a country that had in the past offered asylum to many generations from many countries. It has taken five long, miserable, destructive years before this freedom was won. Won by tens of thousands of Australians who resisted politicians’ lies and propaganda and insisted on reaching out to the children with compassion, love and practical assistance. Among those many were the adult Befrienders who sent us beautiful books and playthings for the children, and the schoolchildren Befrienders who sent letters of friendship and hope. Thank you to every man, woman and child who found, through Befriend a Child in Detention, a means of making a powerful difference, and like so many Australians, refused to countenance injustice, prejudice and discrimination. Now we Befrienders must maintain a watching brief over the future of the children brought to Australia from Nauru. Both major political parties have policies which refuse to allow these children and their families to rebuild their lives in this country. What will become of them? What new dangers threaten them? Until they are truly free, safe and secure, we will continue to advocate in their interests. We ask all our Befrienders to do the same. Watch our Facebook page for further information. Since the refugee and asylum seeker children and their parents were marooned on Nauru by the Australian government, we have been sending them beautiful books and other gifts sent to us by generous Befrienders from every part of Australia, as well as wonderful letters of friendship and hope from Australian children. Now – at last! – almost all the children and their parents have been brought to Australia. That is why we expect to no longer need to send books, gifts and letters to Nauru. We hope that there are never again innocent families held unjustly on that tiny Pacific island – but we remain alert. And so should everyone who cares for these children. While there are children held in detention centres in this country, we will continue to try to help them as we do now, with the gifts and letters we still have. If we need more, we will send out a call. We hope that soon they will be able to live in the community, go to school, and begin to have a normal child’s life. While we do not need gifts and letters for the children, we do ask you not to forget them. Our government needs to know that there are millions of Australians who want these children and their families to live in peace and safety in this beautiful country of ours. We encourage you to remain engaged! Befriend a Child in Detention is a community project committed to seeing an end to the detention of child asylum seekers. We aim to inspire and support compassionate Australians to make a positive connection with the children and families living in detention: to ameliorate their experience, to raise awareness of their circumstances, and to advocate for positive change. There are currently approximately 17 refugee and asylum seeker children still detained on Nauru. The former Border Force boss Roman Quaedvlieg has called for asylum seekers to be removed from Nauru. Mr Quaedvlieg said he never saw Scott Morrison showing any compassion over the plight of asylum seekers, as the Prime Minister recently claimed. Get the full story here. Fewer than 30 children remain on Nauru as medical transfers of asylum seekers and refugees continue, but many families are still separated even within Australia. Read more on The Guardian here. Read the Australian Clinical Psychology Association’s position statement on asylum seekers in detention here. The Refugee Counsel of Australia rightly declares that locking up children is never the answer. Befriend a Child in Detention join the campaign to free 119 children trapped on Nauru before Universal Children’s Day. Read about the campaign here. The suffering of refugee and asylum seeker children on Nauru is close to crisis point. We must make our voices heard by all Federal politicians. There is a new government, and we urge all the politicians to insist that this government releases the children and their parents from Nauru to safety and security in Australia or New Zealand. PLEASE read the letters below and send them on. Old-fashioned handwritten letters are surprisingly effective. And ask your friends, colleagues, family members and neighbours to write or ring or email the Prime Minister and your local Member of Parliament. We must end these children’s suffering! The 12-year-old refugee boy on Nauru who has refused all food and medical treatment for more than 20 days is being moved to Australia with his whole family. Read the full details here. The Guardian reports that a 12-year-old refugee boy who has been on a hunger strike on Nauru for more than a fortnight is at imminent risk of dying, but that efforts to move him to hospital care in Australia have foundered. Read more here. In Robert Manne’s review of Behrouz Boochani’s book “No Friend but the Mountains: Writing from Manus Prison”, he finishes by agreeing with Richard Flanagan that it is “possibly the most consequential” Australian book to be published for many years. A poetic book, it details the suffering and the deliberate and systematic destruction of people who sought our help, mistakenly believing we were a humane and generous nation. Everyone should read this work and be ashamed. Some politicians will read this and be satisfied that their cruel policies have destroyed lives and the personalities of innocent men and women. About 2000 men, women and children have been used as tools to frighten some Australians and to gain electoral advantage by ruthless, greedy politicians. Let us stop this torture and bring asylum seekers here. Robert Manne’s book review was published in The Age’s Spectrum Section, Saturday August 11, 2018. A cartoon by First Dog on the Moon has reflected the fact that ‘There are children of asylum seekers born on Nauru who have been there for their entire lives.’ View the cartoon at the Guardian here. News: Whatever happened to ‘kindness to strangers’? Andrew Hamilton suggests that ‘These events are sometimes attributed to a failure of political leadership. But they may also reflect a deeper cultural change in the Western attitude to strangers.’ Read his full analysis here. A recent photograph of the refugee and asylum Seeker children being held on Nauru, taken by Former Save the Children teacher Gabby Sutherland. Find more information from source GetUP here. “For the good of the refugees who have languished for five years on Nauru and Manus Island, and for the good of the Australian body politic, it’s time to put an end to this inhumane chapter in Australian history.” Read more here. At last count, there were 137 refugee and asylum seeker children marooned on the island of Nauru by the Australian government. We send the children gifts to help alleviate their situation and to assure them and their parents that they are not forgotten. If you wish to contribute, we welcome beautiful new children’s books, educational material, drawing and writing material, and playthings. Please send your gift to P.O. BOX 1282, CARLTON, VIC. 3053. If you wish to make a financial contribution, please follow this link. Humanitarian groups insist “Canada doesn’t have a monopoly on generosity” as they urge Australia to adopt a more community-based approach to taking in refugees. Australian law makers are now being “urged to follow Canada’s lead and adopt a much more community-driven approach to resettling refugees”. Read the full article here. “It is worth considering who else is dead to Peter Dutton. Their names are a reminder of the worth of that criticism.” Read more here. Labour MP Ged Kearney has spoken up about wanting a more “humane” policy on asylum seekers and offshore processing. Read more here. Australia’s refugee policies have been decried as being ‘harsh, inhumane and detrimental to the health and safety of the refugees’. “Read one reason for this here. “When we heard we were to be settled in Australia, everyone was so excited, compared to the life we had been living; we all thought maybe our life was going to change. “Read more here. Why are human beings like Priya, Nadesalingam and their two small daughters being treated like a virus that needs to be eradicated? Read their story here. Ahead of Sydney’s 21st Biennale, world most famous artist and Chinese dissident Ai Weiwei has a message for Australia when it comes to the treatment of asylum seekers.. Read the full article here. Microbiologist Dr Cameron Jones has warned that the issue of mould in the Nauru immigration centre presents a severe health hazard to those forced to live and work within the centre. He described this problem as “10 out of 10” stating that it “couldn’t be any worse”. Read the full article here. Around 12,000 people seeking asylum living in Australia are at risk of losing lifesaving services due to Government changes. Read the full article here. Costs to Australian government are outweighed by need to protect a vulnerable girl, court rules. Read more here. Thank you for all you are doing! Sometimes it seems such a long, hard battle to get these children out of detention. One day we will succeed, but in the meantime, projects such as this at least bring a little pleasure and hope into their lives. Thank you for sending all these books and letters for, all the other kids who need a better life!